If you’ve ever noticed when using an online payment platform like PayPal that you’re often losing a few cents or even a few dollars off your invoices, then you’re not alone. A large majority of Australian and global payment platforms skim a few percentage points off our invoices in the form of invoicing fees. These fees aren’t a big problem if you only use PayPal or a payment platform once or twice a year for online shopping on eBay, but, if your business relies on PayPal payments you could be losing hundreds or even thousands of dollars a year. In this article, we’ll take a look at a few popular payment platforms and how to avoid their invoicing fees. 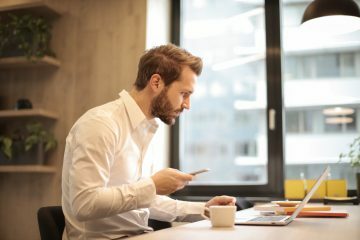 For businesses or everyday Aussies using invoicing software, it’s best to make use of their bank transfers option before their built-in invoicing platforms. You’ll find that on services like QuickBooks Online there are no-fee options when using bank transfers and thanks to recent bank process changes, like Osko, bank transfers can be fulfilled just as quickly as payment platforms. Credit cards, however, will always have different rules. Accepting credit card payments incur a small fee, so the free bank transfer option is a way to motivate customers and clients to use the free option rather than lose up to 2.9% on credit card fees. When there are international invoices brought into the equation, it might be better to consider wire transfers. For transfers to and from Australia, there are different fee structures. However, wire transfers are often faster and don’t have any invoicing fees, which is perfect for larger invoices. You can expect wire transfers to cost around $30 to $50, which isn’t so bad considering a $1,000 invoice through PayPal could see almost $30 wiped off for a service that has more steps and could be a lot slower. There is one more thing to keep in mind though, and it’s that clients will be the ones who need to fit the bill for a wire transfer, so they may either ask you to cut $30 off your invoice. A small few banks and financial service businesses do however offer free wire transfers to Australia, which works out as a win-win for everyone involved. A quick workaround for avoiding invoicing fees is just to be paid less. If you primarily use PayPal for all of your invoicing, then it’s a good idea to ask your clients to pay you less frequently. This is down to the fact that PayPal charges more than just a percentage fee, but also dollar fees for every transaction. Each time you have an invoice paid, PayPal absorbs 2.6% along with a $0.30 fee. We recommend that you request to have invoices paid less often and at a maximum of once a week – or just send them out less often. One of the easiest ways to bypass all types of fees or even an invoicing service altogether is by simply drafting your own invoices and sending them yourself via email to your clients. Both Numbers on macOS and Excel on Windows have invoice templates which make drafting up invoices super simple. Fill out your details, add each service item and price with the total and save it as a PDF and send it off. It’s a good idea to save your customised invoice template so that it’s easy to go back and make changes or create a new one each month. Also, remember not to forget to add your bank’s BSB and Account number or your clients will have nowhere to pay the invoice to. Finally, if you’re lucky enough to have customers, clients or contractors who are happy to use no-fee platforms for invoicing, then you’ll be able to avoid invoicing frees altogether. Take a look at invoicing and accounting web apps like Wave where you’ll find that, unless you need credit card processing, the entire program is completely free. Many of these platforms give you the ability to send invoices, receive them and pay all in one without seeing any dollar percentage, no matter how small, being removed from your final payment amount. Wave touts their ‘No set-up fees, no hidden charges, no monthly fee’ service for small businesses so you can be sure you’re not going to be hit by any sort of fees on their platform. When you consider just how much money you’ve spent on all of your university textbooks, it’s only right that you get some of that back. Luckily, there are a few options when it comes to selling your textbooks. Whether you sell them to a friend, back to the university or to an online platform you’ll be sure that you’re recouping at least some of the cost. It might be a good idea to check websites like extras.com.au to find out whether there’s a deal or discount code for textbooks before you buy them at full price. In Australia, students and graduates have a few places they can sell their unused or old textbooks, most of which are easy to use and online. We’ll take a look over five of the different ways you can sell your texts books in Australia below and a few tips to get back the most. First up is the Australia-wide student website, StudentZIP. Selling your textbooks here is made easy by the super simple five-step process. All you really need to sell your textbooks is an account on StudentVIP, a listing and to choose who you’d rather sell to; students on campus, students in your city or students across the country. Once you’ve listed your textbooks you’ll be buzzed when someone takes an interest and you’ll be able to agree on a time and place to make the swap for your textbooks. Whether it’s on campus, in a coffee shop or anywhere else, the whole process is really easy. Unlike selling to other students on StudentVIP, Co-op buys textbooks directly from Aussie students and lists them for sale in their database. This makes things a whole lot easier as you’ll have an assured buyer – so long as they don’t have too many titles already. All you’ll need to do is head over to Co-op’s seller page and enter in your textbook’s ISBN. The page will tell you right away whether Co-op is taking your title and how much you’ll be offered. If you agree to their purchase or buyback price the next step is just to take your textbook to their store and you’ll be given a gift card. This way you’ll be saving on your next set of books. One website that many students forget to take a look at is Gumtree and eBay. When it comes to selling textbooks, both of these websites are going to be your saviour as they will list your titles on Google as well as in ads so you don’t have to do any of the hard marketing work. Just list your titles with a few clear images and wait for a buyer to message you. Most buyers will need you to send your textbooks across the country or the city, so be sure to factor in shipping costs. If you’re not too sure of the shipping fees, you can check on Australia Post for box sizes, weights and express prices to give you an idea. Another fantastic way for Australians to sell their textbooks is on Bookon’s easy to use marketplace. All you need to do to sell your books on the Bookon marketplace is to choose the Sell Books tab in the main menu and list your textbook’s title and ISBN number. You’ll be able to list your textbook on the Display Shelf immediately. When someone takes an interest in your book or buys it, you’ll have to give up 7% of the sales price to Bookon, however, it’s a small price to pay for such an easy selling process. This platform works similar to StudentVIP in that you’ll have to ship off your books to buyers interstate, so be sure to know your shipping fees ahead of time. If you’re less into the idea of listing your books online and having to ship them out to buyers, then heading down to your local bookstore is the next best thing. You’re able to just hand over your textbooks for some quick cash or a gift card and be done with the whole process. Something to keep in mind when selling to a local bookstore is that there may be a lower final price for your books considering they need to be sold for less their online counterparts.